Valentine’s day is almost here. Consider adding a cooling pillow to your love nest. The gift of comfort is always a winner in my book. I have never really been a flowers and chocolates type of girl. I appreciate any and all gifts that I am given, but in all honesty, I would prefer one that keeps on giving. I was sent a cooling pillow for review purposes. All opinions are my own. Our bed is loaded with pillows. Personally, I like to surround myself with them. I have one under my head, and then several surrounding my body. The dogs burrow their way in between them, too. We definitely have a comfy little nest going on. The goal is to be warm and cozy, except that I prefer a cold pillow. There’s something extra soothing about laying your head on a cool pillow. The Hydraluxe Cooling Gel Pillow stays cooler longer than any other cooling pillow that I have tried. It has a layer of Hydraluxe gel fused onto Memory Foam. This combo makes it crazy comfy along with the coolness. The pillow cradles your head and neck just perfectly for a great night’s sleep. As someone who suffers from frequent headaches, I adore this pillow. Sometimes my headaches are so bad that lying down is the only option. My head usually pounds on the right side of my face. If I lay that side on the cool pillow it really helps. I now do that as soon as I sense one coming on. 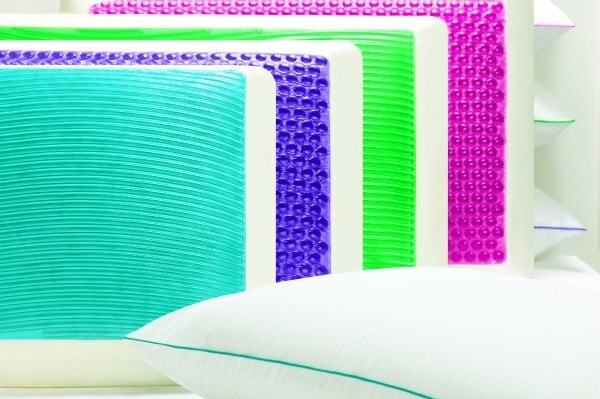 The standard size Hydraluxe Cooling Gel Pillow comes in four fun colors – Cool Cerulean, Frosted Pink, Glacier Green, and Ice Violet – and two different patterns, Bubbles or Waves. 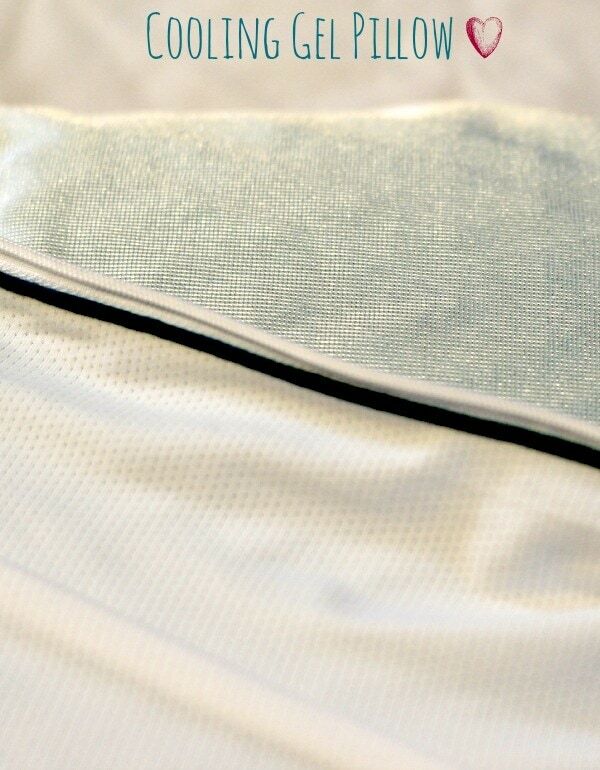 You can choose from either a bed pillow or a contour pillow, with a premium washable cover that’s gentle on the face. I use a pillow case, as well. Comfort Revolution’s Hydraluxe Cooling Gel Pillow was featured on “Good Morning America’s” Deals & Steals segment. The “Dr. Oz Show” recommended it as one of the 12 healthiest gifts of the year. And “The Doctors” also recently featured the pillow as a tool for getting a better night’s sleep. The pillows come in standard, king, and queen size and are similarly priced to comparable luxury pillows. Prices are $79.99 for standard, $99.99 for queen, and $129.99 for king. Shipping is free. Buy a cooling pillow for yourself or send one as a gift at http://comfortrevolution.com. Stay social by following Comfort Revolution on Facebook, twitter, and Instagram to be the first to find out about flash sales, giveaways, and new products. I am constantly hot in the middle of the night and have a hard time finding the cool spot on the pillow–this would be a great item for me. I would like to win because I just started experiencing the joy of night sweats! I would love to win the Hydraluxe Cooling Gel Pillow. I have tried soooo many pillows, and I cannot find anything that helps with my shoulders and neck. This one sounds really great. I am in extreme need of this cooling pillow. I have cluster migraines almost daily. Some weeks are better than others. I have to put ice packs on my head for hours. It’s a horrible thing to have but this pillow would make a difference. I have not heard of them. I would love to win. Thank you. I’d like to win this pillow because I tend to get so warm at night. This would help me sleep better. I would love to win because my mom is always warm and I think this would help her cool off while she is sleeping! I have bad neck problems and headaches when I wake up. The description says it cradles your neck. I would love to see if this would help. the cooling gel. I am always getting hot at night and the cooling gel sure would help. I also like that it cradles your head and neck, allowing your muscles to fully relax as you sleep. I have seen this pillow and wanted it immediately! Being menopausal, it has MY NAME on it! I want a pillow like this where I will not only wake up feeling rested, but I won’t be COVERED IN SWEAT throughout my hair upon waking! Imagine that! I am DYING to have this! I have had two spinal fusions done and I just can not find a pillow that gives me relief from pain when I am sleeping. I do not sleep very well because of this. I just can not get comfy. I always wake up with my neck twisted. I think the cooling aspect of this pillow would be great too. Thank you for the chance. I tend to be very hot natured at this time in my life. This pillow would be a happy addition to my bed along with my running fan to help me sleep comfortably. I would like to win because I overheat at night keeping me from getting the rest I need. This pillow would allow me to sleep comfortably. I have hot flashes and this would really help with them. Thank you for a great giveaway like this. I need great pillows that cool me off–perimenopause is no fun! The pillows on the site look quality and affordable, so I would like to try their products. In a word – MENOPAUSE!! I love the idea of memory foam and gel– and that it would cool me off– great site. I have one of these and love it! I would love another one for dd to use since she LOVES to sleep on mine! I want to win because I always wake up hot and on sleepness nights am constantly turning the pillow over. I also have neck and back issues. I would love to try this pillow. I suffer from frequent headaches, and would love to try this pillow to see if it would help. I would love to win this pillow as mine are pretty old and I need to replace it. Thank you. I have neck and shoulder pain and also my head sweats a lot and I wake up drenched on my head. I think the coolness of the gel side would help my aches, pains and sweats a lot. I would like to win because my mother-in-law experiences frequent headaches and I think this would help ease her pain. This would be a gift for her, if I won. I would love to win to give this to my husband. He is always hot and this would help. If I won this pillow, I would give it to my husband because he often becomes overheated and has trouble sleeping. Thanks so much for this giveaway! I’m really hoping to win. This pillow sounds perfect for me…I have difficulty sleeping, often waking up with neck and shoulder pain because I can’t get comfortable. I would love to win a cooling pillow for my mom because she gets really hot at night. According to the seller “The Hydraluxe Bed Pillow offers advanced gel engineering that cradles your head and neck, allowing your muscles to fully relax as you sleep. Cool, refreshing gel layers are your permanent solution to tossing, turning, and pillow flipping. A premium mesh cover is gentle on your face. Rest deeply and wake feeling relaxed and ready to enjoy a great day.” As I write I have a stiff neck and I will soon be trying out and purchasing a new pillow. I would love to try this one. I need this cooling pillow for hot flashes at night. Been freezing the hubby as I open the window each night plus we have the ceiling fan running! Sleep is so important to proper functioning and mood of the day, I love the idea of being able to have a cool spot for the head as it helps make breathing easier and besides I need to be comfortable. I would like to win because I’m in need of a new pillow, tired of waking up with a sore neck! Why would I like to win? I am one of those women who drives the husband crazy with how cool I love the room at night. Above freezing? Sometimes I actually crack a window a sliver to let some air in…. I’m interested in this pillow, how would it work? Would it help? I toss and turn constantly due to chronic pain so I would love to try out this pillow to see if it helps! TheThe hydraluxe gel enhances circulation, which I really need. It stays cool throughout the night, which the ones I’ve tried do not do. It comes in several pretty colors too. Sounds nice. I would love to win this pillow because it allows your muscles to fully relax as you sleep and I have herniated disks in my neck, so this should help. Also I would love the coolness too. I would be torn between keeping this for myself or giving it to my daughter. I sleep on two pillows and can’t get comfy. I don’t get hot though but my daughter does. The cooling gel would keep her cool and also support her neck and head. I have four children, and they can sometimes all be found in my bed on nights when everyone is sick. Boy, does my bed get hot! A cooling pillow sounds divine, and if you can imagine, four children are expensive, so purchasing one of these pillows is hard to do! I have such a hard time finding a pillow that works for me. I have been wanting to try this pillow and would love to win this to try it out. My daughter wanted one of these for Christmas. Would love to win this to be able to give it to her. Thanks for the opportunity. I would like to win because my pillows make me hot. I always wake up in the middle of the night and have to flip the pillows over. I have been wanting to try these pillows because they sound like they would help me sleep better at night. Cerulean Bubbles Hydraluxe Cooling Gel Bed Pillow-Standardm sounds comfortable and should be able to rest at night. I would like to win because I am a very light sleeper. I need a pillow that offers some support of my neck without being too firm. I have tried at least 10 pillows and I’m still searching for the perfect one. i want to win because i’m all about comfort and i would say so is this company. I would like to win cause I have trouble sleeping and have yet to find a good pillow that will help my neck and I know this would be the perfect pillow to help me with my lack of sleep.. I would like to win because I have a cooling mattress cover and absolutely love it! I really think that the pillow would be something that I would love as well! With the warm summers and no air conditioning, this would be amazing! I would love to give this pillow to my son for his neck and back problems. Looks incredibly comfortable and cooling, would be a perfect pillow! Even though I am post menopause, I still have ridiculous hot flashes esp at night! The Hydraluxe gel technology would be awesome for me and I would not have to keep turning my pillow over and over trying to find a cool spot! I would love to win this because I have degenerative bone disease in my neck and it’s very hard to get a comfortable pillow. I think this having memory foam would be very beneficial for me plus I sleep better in a cool environment so the cooling of the pillow would help with that. I want to win because we have one of these pillows that the mister and I share which works half the time. He works 15 nights a month, so he uses during the day. However, he wants on his nights off, and I want my own pillow. This is off the chain if you have all night long hot flashes like I do now that I have entered old. I would love to win because I haven’t replace my pillows in 5 years and it’s getting incredibly flat! I love that this pillow has Gel and Memory Foam Fusion to cradle and support my head and neck so I don’t wake up with neck pain and a headache. As I have gotten older I don’t sleep as well as I used to and I spend a lot of time flipping my pillow over to find a cool spot. I believe this pillow would give me a better night’s sleep so I could wake up more refreshed. I am always so hot, this would be awesome to help keep my body temp lower! Maybe I could actually sleep through the night!! I would like to win because this would be great for my husband. He gets migraines that aspirin don’t seem to phase, so the cooling pillow might help him when he gets one. I would like to win because “the cool side of the pillow is one of my favorite things” and with this pillow, I could have that all the time! I am constantly on the lookout for a truly comfortable pillow. So far, I haven’t found one. I would like to win as I have an accident injuries that require good support and comfort and I get overheated easily, so this pillow would be great ! I would love to win because I hate having to wake up in the middle of the night hot & have to flip my pillow all the time! I’d love to win any one of their pillow. I constantly am flipping my pillow. I hate when it gets hot and not to mention, my pillows are too flat and do not give my neck the support I need. On the site it said ” Rest deeply and wake feeling relaxed “. It’s been so long since I’ve had a good nights sleep I have forgotten what this feels like. I would love the memory foam pillow for hubby! I want to have that pillow since I get hot at night and start flipping my pillow to get a cool spot. I would like to win because I have searched for years for a comfortable pillow. Nothing ever works. This gel pillow looks like it would be comfortable. I would love to win this. I feel I’ve tried everything. On an average I get about 3 or 4 hours a sleep a night. I’m a 53 year old woman with hormonal issues. I sweat and toss and turn. I am desperate for some relief. Glacier Green Bubbles Hydraluxe Cooling Gel Bed Pillo would be awesome to try! I get migraine headaches, and the Hydraluxe Cooling Gel Pillow will help me feel better, now I use cool cloths to help me. I would love to win, because I’m trying to find an amazing pillow to sleep with. I’ve been having trouble lately with all pillows I purchase going flat. I’m nervous to buy a super expensive one because if it goes flat that is a lot of money to waste! I would love to win this cooling pillow for my husband. He has such a bad time sleeping because his head is hot. Even with a fan on him. This would be a welcomed relief for him. I always have a hard time getting comfortable at night. I stay hot and this would be the answer to my prayers. If it does what it says it would provide a wonderful nights rest cradling my head and neck and KEEP ME COOL. I toss and turn a lot and hopefully this would eliminate that. I would love to win because the advanced gel engineering in the product would cradle my head and neck, allowing my muscles to fully relax as I sleep. Cool, refreshing gel layers are my permanent solution to tossing, turning, and pillow flipping which I am in desperate need of!!! I’d like to win because I can never seem to find a comfortable pillow, I have one right now that’s great in the summer but in the winter it gets cold in my room and it feels like I am sleeping on a brick. I would love to win this pillow for my son who has been having issues with sleep for the longest time. Thank you for the opportunity for such a terrific prize. Like you I also get frequent headaches and also migraine headaches around my period and I can see how this would be very soothing when you have a headache. I always get hot at night so this pillow looks great, hopefully something like this would help me sleep better and possibly avoid sleeping with a fan pointed on me. I suffer from night sweats and I think the Cool, refreshing gel layers would be a big help. Ever since I gave birth to my son years ago, I get very warm in my sleep. A cooling pillow would probably do wonders for my comfort at night, especially in the summer. I would like to win because my husband is always complaining that the pillow makes him hot. We’ve looked at “cooling” pillows in the stores and they’re usually so expensive, especially since we don’t know if they’ll work for him. This would be a great opportunity to try it out. I would like this product because I am always hot at night no matter what. I use a fan and just a sheet and am always still warm. I have hot flashes and night sweats and I could really use this cooling pillow. I keep getting new pillows that don’t seem to last very long. I’d like to try getting a new type of pillow that would work better for me. I always flip my pillow many times during the night because it always gets warm. I really love the Frosted Pink Bubbles Hydraluxe Cooling Gel Bed Pillow. It would match my bedroom. I would like to win, because I need the comfort of this pillow, and so does my wife. When we bought our new mattress & box spring last year, we checked this pillow out as well, and were quite sad that we couldn’t afford one of these as well (they would’ve put us over budget). They’re extremely comfortable, especially in the Summer time. This would also do well to help any time we have a migraine, thanks to the cooling. Winning this pillow would mean so much to me! I suffer from Rheumatoid Arthritis and finding anything at all to help me get a more comfortable nights sleep is really hard. This could be what I need to sleep better! I suffer from arthritis in my neck and I think this product would really help that in aid relief. I would consider buying this product. It would also be good for road trips I believe. Thanks, great review with detailed information. This is what I need. I am constantly flipping my pillow. I don’t sleep well and and I wake up feeling lousy with a headache. This is really an amazing pillow and it is the every night bed partner of mine. I really love it. Thanks for sharing.